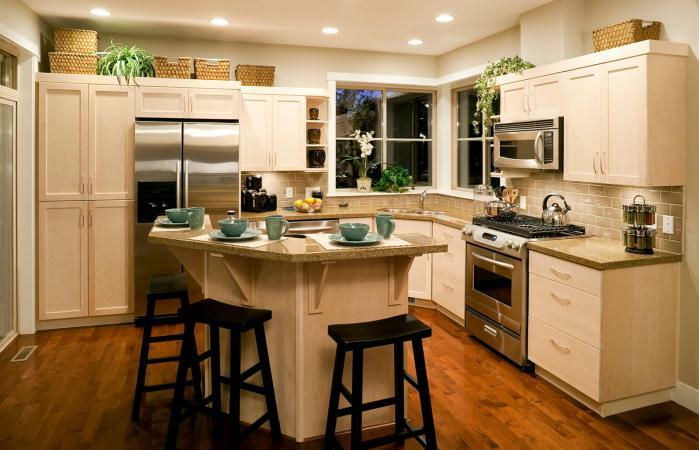 Feng shui kitchen location is vital to a home's overall feng shui health. Feng shui principles dictate your kitchen is the heart of your home. The Chinese placed the kitchens in the east or south sectors of their homes to promote the kitchen's fire elements. Location is everything when it comes to your kitchen, even the feng shui refrigerator placement and placement of other appliances. There are several key feng shui elements to which you need to pay close attention when working with your kitchen layout. Placement of your appliances needs to follow feng shui principles of fire versus water and hot versus cold. The placement of your appliances is sometimes more important than the actual direction your kitchen faces because incorrect appliance placement can create inauspicious elements and negative chi. Don't locate the kitchen in the front of your home or facing the front door. This kills any positive chi attempting to enter your house. Don't place the kitchen facing a bedroom. The chi energy of the kitchen is yang and conflicts with the yin energy of the bedroom. This kind of configuration results in family members constantly being sick. Don't locate your kitchen in the center of your home. Don't place your kitchen below an upstairs bathroom or facing a toilet. Water and waste destroy the auspicious chi. Make sure the living room, dining room, and kitchen areas are all on the same level. The shape of a kitchen layout should be a rectangle. Avoid a round-shaped kitchen. If a laundry area is located in or beside the kitchen, don't allow dirty clothes to pile up. Some colors are ideal for kitchens, such as green and brown wood colors to fuel the fire element associated with this room. The color red represents fire and isn't the best color for kitchens. Red should be used sparingly. 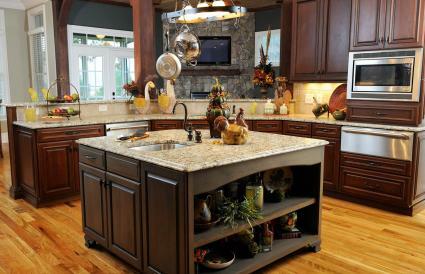 You can use colors that represent different elements to create an attractive kitchen. Different lighting choices can address afflicted areas in the kitchen to correct inauspicious feng shui. These choices go beyond overhead lighting to embrace task lighting, recessed lighting, and even lamp lighting. The range and oven mouths should face either Northeast, Southwest or South. The mouth is defined as the area where the energy enters the appliance. This means any gas lines, oil lines or electrical lines and outlets. Kitchen ovens and ranges are considered fire elements so you don't want them beside sinks, dishwashers or refrigerators. The water and cold elements conflict with the fire and create inauspicious elements. This water element extinguishes the beneficial fire energy. Don't locate the oven or range in the Northwest sector known as "Heaven's Gate." Good luck energy resides in the Northwest direction and is the last place you want to set on fire. If your dishes, pots, and pans are chipped, old and worn, it's time to replace them. Any that are bent, dented or have missing handles should be tossed out and replaced. As with all things feng shui, everything should be in good working order and look neat. You can coordinate the colors and style to your kitchen decor. You can use feng shui sector colors as a guideline for selecting these necessary kitchen tools and equipment. Keep pantry doors closed at all times. Don't leave brooms and mops out. Keep these stored in closets. Don't let dirty dishes pile up. Don't hang a towel through the oven handle. It's very important that the doors in the kitchen don't lead directly into the front or back doors. This kind of alignment means the chi energy rushes through the kitchen and out of the house. When this kind of placement occurs, it creates unbalanced chi that brings illnesses and misfortunes to those in the home. There are a few things you can do to help boost the auspicious elements of your kitchen chi. Hang a mirror so the burners appear to be twice as many to increase finances. Copper pots and pans attract positive chi. Potted plant or herbs along the South and East walls brings prosperity. The feng shui rule of thumb is for it to be located within the inauspicious direction specific to the main breadwinner's Kua number. A kua number is calculated by using a formula that uses your birthday and gender. Simply add the last two digits of your birth year. If the result is double-digit, then continue to add down until you reach a single digit. If you're female, add 5 to your result and again, reduce to a single digit by adding the numbers together. If you're male, subtract the single digit number from 10. This number will help you find the best directions for sleeping, sitting, eating, working and so on. Kua numbers are broken into two groups, East and West. There are specific auspicious and inauspicious directions for each group. If your family's biggest income producer falls into this group, then your kitchen should be located in the opposite Kua number group directions. That's because these directions are considered inauspicious and the kitchen will serve to neutralize those energies. Below are charts for each group and its kua numbers. The best direction for your kitchen is given; however, you can also use any of the group directions and still have a good kitchen location. For example, if your kua number belongs to the East Group, you can place your kitchen in any of the West Group directions and vice versa. Consider your health sector when designing your kitchen. This can impact your overall chi and is sometimes more important than direction. This is especially true when making your oven and range placement decisions. An incorrectly arranged feng shui kitchen can be a challenge since your appliances are permanently installed and it's expensive to move an appliance. Planning feng shui kitchens helps you avoid making mistakes that create inauspicious elements.